First day back at work is never as bad as you think it’s going to be. It was nice seeing everyone again. There are a lot of teachers at my school that I consider real friends, not just colleagues and I’m very lucky to be able to say that. I didn’t run today which depressed me a lot but my body was just exhausted from lack of sleep, work, continuous training for the last 15 days straight. I couldn’t do it. Tomorrow I will be. No matter how much it hurts. 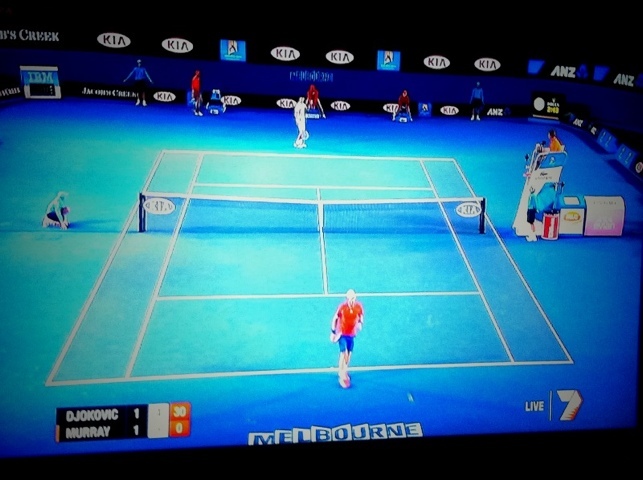 I’m watching some tennis now while my partner goes to sleep. Tennis relaxes me and I am a Djokovic fan so I need to see him get through. Murray is playing great tennis right now though so it’s not a definite for Djokovic. Here’s hoping. Now it’s just dealing with going back next week to all those teenagers. Today Jayson and I went on our photographers exhibition to Taronga Zoo in Sydney. Many a photo was taken. Jayson really likes animals and animal documentaries and would love to be a wildlife photographer some day. I’m more into people photography, portraiture, but I took a bunch of photos today anyway. It was particularly hard to choose today’s favourite, but there it is, a meerkat. One of my favourite animals, Meerkats never cease to amaze me. This guy, just having a chill out on his belly. The Zoo was quite packed today and we were roastin’, it was up around the 30 degree mark, but it was a great day, I had a blast. It was nice to get out there, take photos and forget that I have to go back to teaching in less than two weeks and I still haven’t finished all the work I have to do before going back. Today was a day of fun and distraction. Tomorrow I’ll work, I’ll have too, surely. I’ll do another post later on with some of my other favourite photos from today. Today I had lunch in Parramatta with friends I met when I was traveling around Europe. From left it’s Ange, Jeanette, Jet and Natasa. I traveled through 10 countries in 4 weeks with these guys and I can truly say, they made the trip what it was for me! I suffer from quite high anxiety, especially during periods of change and without the 4 women in this photo, I would not have had the amazing experience that I did and overcome my anxiety. So many memories and so many laughs with this lot. I couldn’t have asked for a better group to share such incredible experiences with. I love catching up with them and remembered all the hilarious and awesome things we did together. I have formed a bond with these guys that will never be broken. We haven’t seen each other, in almost year and yet it feels like we were just together eating lunch in Venice, or Prague, or Lucerne together. I am very grateful for travel buddies and friends like these guys. I apologise for this post being a day late but I got home late last night and could not post. Yesterday I had dinner with a good friend. The kind of friend that I know I could never replace. I can truly say I don’t know anyone else like her. Jane and I have known each other in one way or another since we were 12. I met her through a friend when we had just started high school and as we’ve grown up, we discovered we have more and more in common. It was a good time, the sort of night you don’t want to end because it’s just nice talking and laughing and catching up. As we get older I think it becomes increasingly difficult to maintain those close friendships with people who you don’t see everyday, it’s comforting to know some relationships can last, no matter what the circumstances. Today I headed home from Newcastle. My partner who accompanied me had never been to Newcastle and on the trip home we decided to stop in at the Australian Reptile Park near Gosford. It was the best decision we could’ve made. We had an awesome time taking photos of all the animals and just generally being excited to be “traveling”. I’ve always really loved frogs. I used to scoop them out of my pool when I was little and they would be just floating around in there. I’d keep them with me on the grass for the day then let them run free, hoping to find them hanging out in the pool again the next day. I am especially fond of green tree frogs as they just seem so chilled out to me. Today’s photo was a hard decision as there were so many to choose from but we settled on this one because the guy in focus is just having a nice chill session on his log with some friends. I have a trip to Newcastle for two days to stay with an old friend of mine Emma. I met Emma when I started teaching at Erskine Park and she helped me through some very tough times in that first year ad basically convinced me not to quit teaching. Emma has recently had a baby girl Matilda, so this trip has allowed me to see an old friend and meet a new one. It has been a long time between visits and it’s always a relaxing stay. 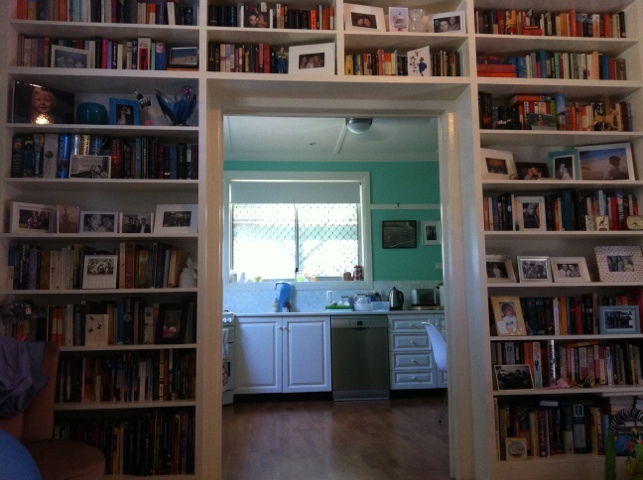 The photography for today is of Emma’s amazing book case built around her door way. All those book fanatics, enjoy!